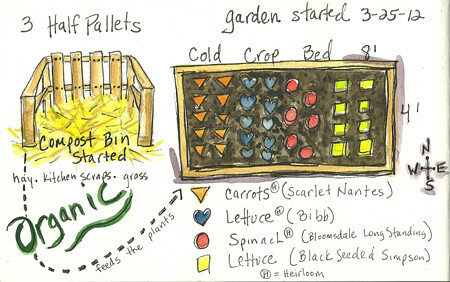 Backyard Garden Sketch – Let's Paint Nature! Do you remember a few months ago when I failed big time on harvesting black walnuts? My harvest resulted in much work and no payoff. Zip. Nada. And to tell you the truth years ago that would have been just enough to discourage me from trying again. I would have believed the negative thoughts in my head. But do we give up when we fail? We never give up. We don’t give up when our harvest fails. We don’t give up when our art fails. And we don’t give up when life seems to fail us as well! We push on with as much force as we can muster and ask God for help and guidance. So this year, I’ve constructed a few raised beds in my backyard and dove into as many gardening books as I could get my hands on. 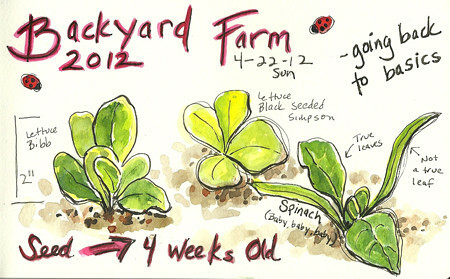 This sketch shows my layout for the cold garden bed (carrots, lettuce, and spinach). The compost bin is made out of 3 half-size wooden pallets that I cable tied in the corners. Hay is the bottom layer, then kitchen scraps…etc. A plastic tarp covers the compost bin to help keep rain water out and heat in. 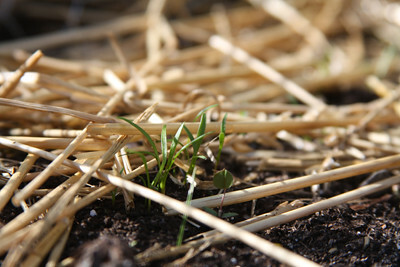 Four weeks ago I started the cold crops from seed and today I have little baby sprouts….awe so cute! 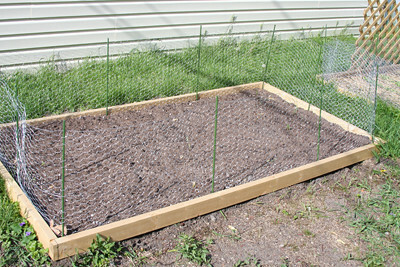 24″ chicken wire all around to keep the rabbits from eating everything. Marigold plants do not work…they eat those too! This bed will contain beans and tomatoes later on. Tiny Scarlet Nantes (carrots) starting to grow. 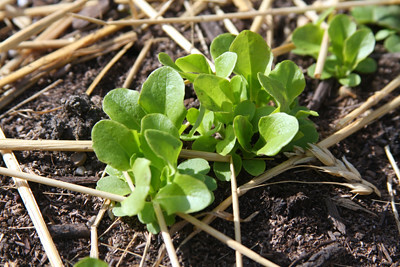 And here we have Bibb Lettuce which has a nice dark green color in comparison to the Black Seeded Simpson Lettuce I planted which is a yellow-green right now. These will have to be thinned out soon. There are many battles up ahead, I know. With God’s help, we can overcome. Every challenge makes us a little stronger if we don’t give up. It is all a learning experience!, isn’t it? I am eager to see how your garden grows. Love the sketches and all the details. Great post! It is so exciting to see the little baby sprouts! Thank you! I was very very very happy to see sprouts. Let’s hope I can keep it going. Your sketches are perfection. Have you ever submitted some of them to gardening magazines, or others devoted to country living, nutrition, growing your own food, etc? They’d be absolutely perfect. I gotta think you’d be in big demand– really. Well, just an idea. You gave me a great idea about submitting sketches to those magazines. I think I will look into that! Thank you. It’s funny, when I do my motivational typing, mostly it’s for myself. You wouldn’t believe how many times I need to remind myself of those positive things! I hope to kill two birds with one stone by helping others choose positive over negative as well.